As negotiations over Britain’s departure from the EU reach the final straight, Legal Cheek is partnering with magic circle law firm Linklaters for a session about what Brexit means for future lawyers. Apply to attend. Right now, whether it ends up being Chequers, CanadaPlus, Norway-style or a second referendum, the only certainty is that there will be more uncertainty as divisions within the Tory Government and the opposition Labour Party ensure that no path is straightforward. 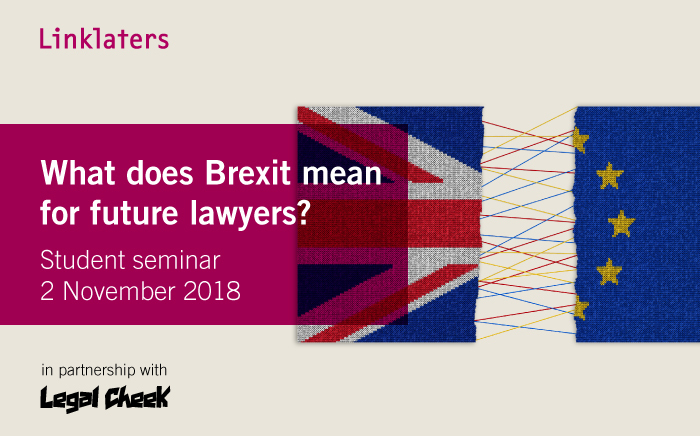 On the afternoon of Friday 2 November a host of leading lawyers will take questions from an audience of over 100 aspiring lawyers about the effects of Brexit over the short, medium and long term — and what it means for those seeking to enter the legal profession. The session will be chaired by Legal Cheek publisher Alex Aldridge. The event commences with a panel discussion from 4pm-5:15pm, after which there will be drinks, nibbles and networking with the lawyers on the panel, trainees and members of Linklaters’ London graduate recruitment team until 6:30pm. Apply to attend below. You’ll be asked to submit a CV and two questions for the panel. Please note that the details of those offered places will, subject to consent, be shared with Linklaters’ graduate recruitment team. THIS EVENT IS NOW FULLY BOOKED. Our next London event is on Wednesday 7 November with Herbert Smith Freehills — apply to attend.